Noni fruit has gained worldwide notoriety in recent years for its health benefits, but also as a result of how those benefits have been exaggerated. Noni fruit is packed with nutrients – some well known, others more mysterious – that can help you to live a healthier, longer life. Several animal studies have shown that noni fruit can help to reduce tumors, enhance the immune system, and relieve pain. Scientists in both the public and private sectors have widely demonstrated that the health benefits of noni fruit, while often wildly exaggerated, are not to be dismissed. 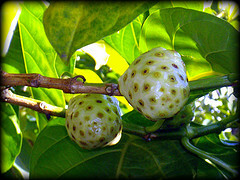 Noni fruit comes from the noni tree. When ripe, a noni fruit is about the size and color of the inside of a pear. It contains many seeds and has a distinctive, pungent odor. It is soft and dripping with juice. The tree grows up to 30 feet tall in a large variety of habitats: volcanic terrains, lava-strewn coasts, clearings, and limestone crops. Its resiliency has allowed it to spread from its native Southeast Asia to neighboring India and the Pacific Islands, and as far as New Zealand, Australia, and South America. Its leaves are large, dark green, shiny, and deeply veined. Its small white flowers give rise to fruit that is bright green when young, and yellow or white when ripe. Over 2,000 years ago, the inhabitants of what is now known as the Polynesian Islands domesticated the noni tree. They used all parts of the tree as food, medicine, and dye. It is said to treat many maladies, including constipation, diarrhea, skin inflammation, infection, mouth sores, fever, contusions, and sprains. Many other cultures have used noni fruit as well. For example, the Chinese have used it for the digestive system, kidneys, heart, and liver. Today, noni fruit is available in a wide variety of formats, including juices, powders, capsules, even soaps and shampoos. Used in conjunction with modern medicine, the noni fruit can be a valuable health supplement.